so what better place to have tea than in the sunroom! I brought out my new sterling silver tray that I received from my sis for Christmas, (yep, she's one great sister!) and a pretty pink floral Staffordshire teapot, cup and saucer, and journal to start the day. I've been putting a few new pendant pieces together for Valentine's Day. and of course some blinged keys. and found these sweet little postcards last weekend at Spring Creek. and my booth at Spring Creek, in Ozark. and have a few more designs in the works. I'm lovin' these little Puffy Hearts! here at Vintage Inspiration Friday, February 11. 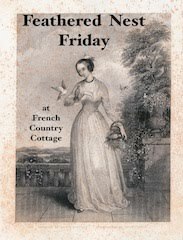 Hope you can join in for Vintage Inspiration Friday! Please be sure and link up within your post and then visit a few friends! Hope you're having a little sunshine and romance in your life today. check out the sidebar for this month's mini give away! Wow! Where to begin? First of all that silver tray is totally amazing. What a gorgeous gift. I love the "bling" keys. Especially the one with the little watch and cherub. Very sweet! You gotta love a sister who "gets" you and gives you the most fabulous gifts! I love it, and the china, and the necklaces. You are so creative with the mixing of the elements in such a beautiful way. Sheer love happening here. Thanks for having a great party too! Love the silver tray from your sis, so nice to have sisters. I will be seeing mine soon, we leave next week for fun in the sun! I can hardly wait. You necklaces are gorgeous! Love these. Your new pieces are just stunning, Debra! Love the nod to Valentine's Day with the hearts and cupids. 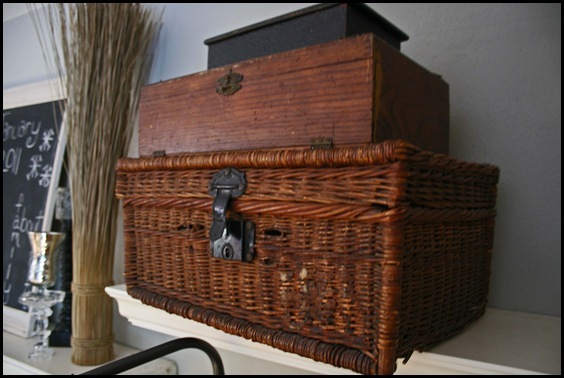 I love how you made a little shadow box out of that sewing drawer. Clever! Thanks so much for hosting this fun party. Gorgeous tray with the sweetest teaset! Love the jewelry, you are one talented lady! Have a blessed evening! HUGS! I love your tray and the pretty tea pot, cup and saucer. The floral pattern is beautiful! As always, your jewelry is beautiful...I like the blingy keys! Debra, what wonderful photos. Love that tea set and that wonderful silver tray. I am on the hunt for a nice sized silver tray. Debra first off, your new header is so beautiful! You really have a way with display. I love your tea set, I just love it! Wish I could join you at that lovely tea setting. Thanks for hosting Debra! What a lovely vingette you have created on your gorgeous silver tray. What a sweet sister gift. ...you are always having such sweet little breaks, and always so lovely presented! And I love that room of yours. Full of light and vintage pretties. You always think of every small detail. You're a master at vignettes and your wonderful creations! Your pictures are ALWAYS so beautiful! You have quite the talent with a camera. I love your necklaces and was so happy I was one of your lucky winners and won one! Have a great week-end. I love the bling keys!! What beautiful pictures you always post! I have sunroom on my mind as well for Vintage inspiration Friday! Very lovely, Debra...your jewelry is so pretty! Beauty just surrounds you ! You just inspire so much talent girl. Thank you for featuring my tablesetting! What a fun surprise to see. Wow, Debra! Your blog has blossomed like crazy! 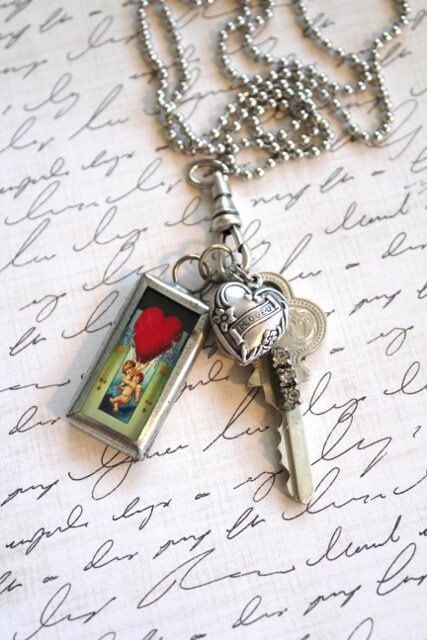 I just love this post and your key necklaces are such darling vintage treasures....I love them! Have a great weekend.....and I really enjoy your blog! As always, a beautiful and romantic post! Love the teapot and your jewelry! Thanks for the linky party. Your tea set is beautiful, Debra, what a fabulous way to start a new day! And your pendants are nothing short of amazing! Love them all. Thanks for hosting this inspiring weekly event, I am joining for the very first time. Beautiful porcelain (I love it!! )and pretty photos. Hi Debra, this blog is one of the most ispirational and rich I ever seen,gorgeus!! !.I love your photos!.I will follow you, please accept my strange english, because I'm italian!Have a nice week end!. These are so pretty! Thank you for having me for my cup of tea!! Debra, Happy Friday!! So happy to be linking up with you today. I've been meaning to tell you that I really like your header photo. Hope you have a great weekend too! What a beautiful valentine post-but you always have beautiful things to show and displayed so well! Happy Friday Debra. Love your necklaces. Your post is beautiful. Have a wonderful weekend! Joining in the fun with you today for the first time and have become your newest follower. The necklaces are delightful and I'll be looking at your Etsy very soon. I am loving your new jewelry! Did I ever tell you that every single piece of your jewelry sold out at the shop?!! Everyone loved them! I treasure mine, too. Love the tea, but the bling is fantastic. Debra, your post is a Valentine's Day delight!! I love the vintage cards, and your jewelry is just gorgeous! What a precious gift your sister got you... love the silver tray! I am visiting via the French Cupboard handmade Valentine party. Your darling header and post photos today are so refreshing and springlike! The new jewelry pieces are so lovely too. Thank you for hosting and I hope you have a wonderful weekend! Your pictures are always so beautiful. The silver tray is so pretty with all your gorgeous jewelry and the tea set. Your jewelry looks so pretty with this beautiful backdrop you've created! Thanks again for having us and hope you have a great weekend! Hi Debra ..that silver tray is just stunning ...what a great sis !!! Your new key pendants are beautiful ..I love the puffy hearts too I have some in the brushed silver look and use them often. Stop in to our blog if you get a chance we are having a free giveaway right now and a blog party on Monday Feb. 1st ...If you have a chance to participate. Wow! everything just looks gorgeous! but i have to tell you that the pendants have to be my favorite! they are just stunning! i hope that you have a beautiful weekend! Love all the new additions to your etsy. You know the one I got from you is still one of my favorites. What sweet treasures! And I must say that I love your header!!! Perfect for Valentine's Day! Debra....I was almost too late!! I feel like the rabbit in Alice in Wonderland. I think I got in under the wire. Just want to tell you that I love your Valentine jewelry so. I am getting ready to take some jewelry classes that my husband got me for Christmas. Your's is truly a style I admire. Also...looking forward to checking out your bible study blog. I haven't visited there before, but it is calling out to me. I wish we were neighbors...I'd love to have tea with you in your sunroom...so pretty! ----and your silver tray from your sister ,with the beautifull teapot-it is so lovely,together. Another beautiful post from a beautiful heart. 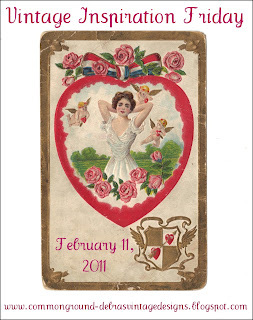 I hope it's okay if I join the Valentine party for Feb.11th..I grabbed your button and link and have it on my sidebar.. I love what you have been making and showing.beautiful..
What a great vignette. Love that tea pot.